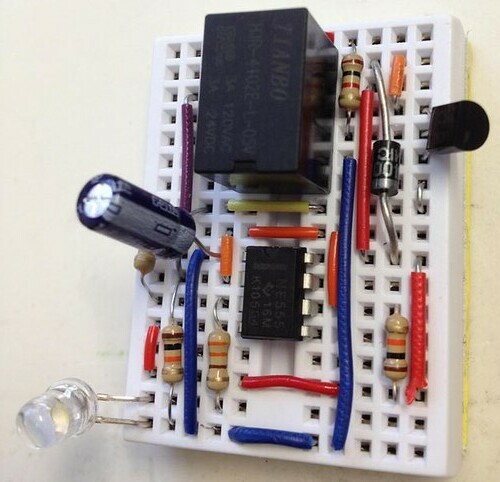 Description: The following circuit works as a toggle switch. The circuit has two stable states, ON and OFF. Once it is ON, it remains ON till you press the switch again. 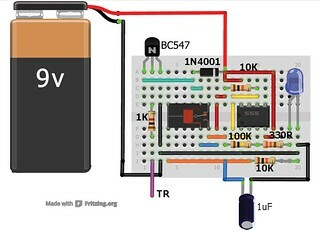 The project has been derived from buildcircuit.com. 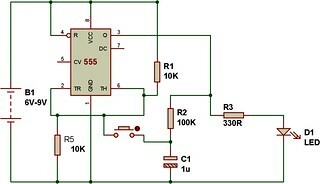 You can also operate this circuit using a relay. HOW TO USE A RELAY? In all MINIBREAD projects, we have used the following schematic. When resistor 1K(connected to Base of transistor) gets positive voltage, the relay gets activated. Input voltage to TR triggers the relay. Use this project to make Remote operated switch, Light operated switch, Clap Switch. What kinde of relay are you using? SPDT type of 5V relay. 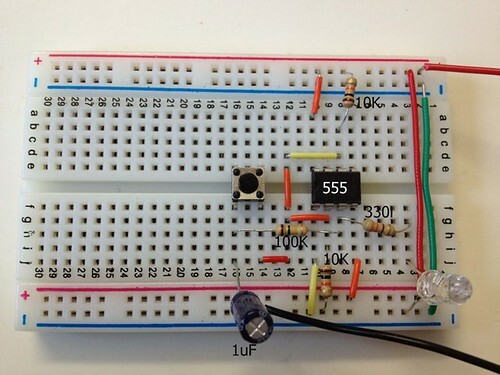 What about the 555timer? I am building the relay project my self, but I need to order parts:S Is the 555timer a NE555P? Does it need to be in operating Mode: bistable mode? Will this timer work http://www.ti.com/lit/ds/symlink/sa555.pdf ? I’m using the very first ckt. I’ve connected (1st) relay as a On-Off switch which is being excited thru external signal & instead of LED with 330R (as shown), I’ve connected one more (2nd) relay. This circuit switches the second relay perfectly on the power ON-OFF cycle of first realy. But on the Power ON-OFF cycle of whole circuit, ckt switches the second relay once. What could be the possible root cause for this problem. I’ve added protection diode on the first relay only. I’m using the very first ckt. I’ve connected (1st) relay as a On-Off switch which is being excited thru external signal & instead of LED with 330R (as shown), I’ve connected one more (2nd) relay. 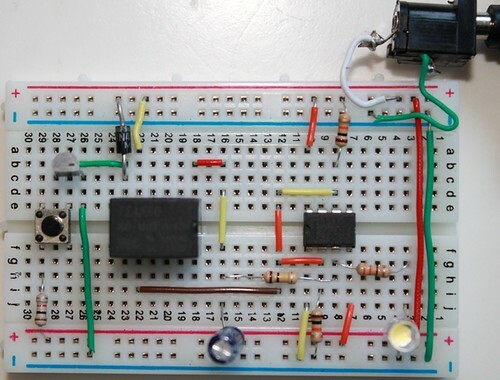 This circuit switches the second relay perfectly on the power ON-OFF cycle of first relay. But on the Power ON-OFF cycle of whole circuit, ckt switches the second relay once. What could be the possible root cause for this problem. I’ve added protection diode on the first relay only. I’d like to drive one more relay instead of LED. I’ve tried it by connecting 2N2222 with 100 ohm in series in place of LED/470 ohm resi. and it did work but the problem is that when I hold switch more than 1-2 sec the relay gets OFF. hi, is there a way to change the switch with a 5v input? like, momentary 5v in activates the output. momentary 5v again, it disables the output? Hai, I would like to replace the above circuit’s momentary switch with another circuits’s output pin. Could you tell me how to do that? Hi all, can you please suggest me how to build a circuit that switch on and off a load in every 1 hour continuously.